1. I need to start shopping the back aisle end-caps at JoAnn’s more often. 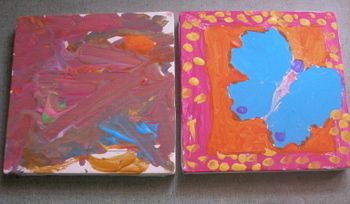 Today, in a clearance section the girls got these stretched canvases, including paint for $2. They were so focused working on these. You know how dinner conversation goes quiet when a good dessert is served? It was like that. Total silence for almost 30 minutes. AND I found a speedball block-printing kit for $3. It has everything you need. I’m saving it for a rainy day. 2. Last night’s dinner was really good. And the lemon yogurt cake was killer. I was short one egg and used vanilla yogurt instead of plain but it was still amazing. And I made the glaze too runny (I was baking with baby in the pouch, and basically one hand)–so I poked little slits in the cake for the glaze to seep in…double yum. I’ve tried everything I can think of except for a new needle (which I got a JoAnn’s today). Of course, I’m about ten stitches shy of finishing a simple diaper cover for Elizabeth. I hope it’s the needle. 5. This week I found these amazing bedspreads at a little artsy spot just outside of Baltimore. It’s a small block of shops and restaurants tucked together in town…and it turns out is was a short two minute drive from the hospital where I ws going for all my prenatal checkups. (Although, for my pocketbook’s sake, it was probably good that I didn’t discover it until this week.) 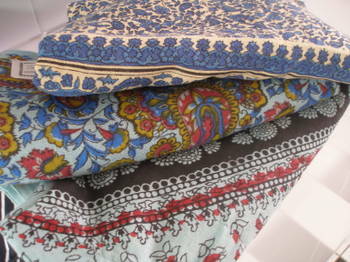 The bedspreads were only $19 and they are summery and light. But the thing I like the most about them is that this is the same place my grandmother gets them too and they remind me so much of her house. She mostly uses hers as tablecloths now, but they used to be on the beds up in the attic where the boys slept. I’m so nostalgic about things like this. 6. As I sit here typing, Emma is sitting on the arm of the rocking chair (rocking back and forth) eating cherries and spitting the pits into the trash can which she has pulled up beside the chair–and she’s waxing on and on about why it is good that birds have their babies in the spring. That’s my girl. 7. After a discussion with my husband the other night I think I’ve come to the sad conclusion that I’m going to have to give up pottery for awhile. I just don’t have the time to get up to the college. I’d get myself a small kiln to work at home, but I just don’t know what the electrical wiring is like where we live right now. I’m sad to see it go for now. But I guess everything has it’s season and I WILL get back to it, somehow. In the meantime, I might work a little more on my bandsaw skills. I’d love to make a few more of these. and these. 8. Now, I’m the one waxing on and on….so, Happy Weekend All! My machine sporadically does the same thing and I can not (for the life of me) figure out why. It isn’t the needles (I’ve used thin, thick, upholstry). I’ll definitely be watching to see if you find out the problem. It drives me CRAZY! We have a bird (a parakeet) that my husband had before we married. I think it is about 10 years old now. I wish Elise liked birds as much as your daughter — otherwise I just feel really bad having a bird in a cage! I took a good year off from pottery after Elise was born, and I just had pottery on the brain for a year (reading books, sketching, imagining). Just the mental work made me a better potter when I came back to it. It’s not the same as physical practice, but it is something! This response helped me at the time:”Birdnesting” occurs when there is no tension on the needle thread to pull the bobbin thread. This is easily corrected by rethreading the machine, following the threading path carefully and making sure the thread is fully engaged in the tension mechanism. I have trouble getting the tension right. Looks like it’s all about birds today! The sewing machine thing looks like it might be a tension problem. Have you tried playing around with that? And those bed spreads are BEAUTIFUL! Lucky! 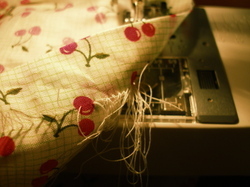 When my sewing machine acts up, it is usually one of two things. Dust/fuzz in the shuttle or a poorly wound bobbin. Good luck. 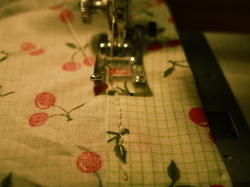 my sewing machine was doing that too – check the obvious tension problem. i ended up taking mine in – that fixed whatever it was. (thanks for the joann’s tip – must get over there – tell your girls their paintings are gorgeous). I had the same issue, for ages and I about threw my machine across the room. I tried rethreading and it helped some, but not enough. Then someone mentioned the bobbin might be the problem, so I unwound and threw out the thread on the bobbin I had been using. I find that the less expensive the thread, the more problems it has and this is the result. Now as long as I make sure i keep super even pressure when loading the bobbin and watch to make sure it loads smoothly, I haven’t ever that the problem again. The other thing that I learned recently was that there is a little tiny screw on the bobbin case (at least on mine). They told me that the threads can get loose and you can replace it for about $10. Or, try turing the screw tighter. I went and tried that first- a quarter turn to the left, and it is amazing how much it fixes stitches. I do that now when the stiching just seems even a little loose, and it helps. i hope you had luck with your machine. there is nothing worse! i know you are sad about not working in clay for awhile….you will come back to it, and like amy said, you will be a better potter. Those bedspreads are so pretty! !, I always find big ugly ones when I shop. what a beautiful list. your daughter’s reaction to the birds makes me want one! i wish you well in making a decision about the pottery. it’s so hard to give up a creative pursuit that you love. i think your work is stunning, and i’m sad to think that we won’t see more of it for now. but i hold on to knowing that it will be back. My machine does that if I use different thread in the bobbin from what’s on the reel. But I’m sure you’ve thought of that. My machine was doing that too. It actually turned out to be that the fabric I was sewing through was a bit too thick and not feeding properly! Try using the walking foot if you have one – I suggest you buy it if you don’t. This fixed the problem for me. It is definitely NOT the bobbin or bobbin thread – that would be bunching on the top. It’s the top thread that goes through to the underside. I learnt all of this through trial and error and a couple of online services. They also warned not to fiddle with the bobbin tension! If all else fails, time to take it to the shop for a service. Good luck! Kitty is desperate for a canary but we are holding out as long as we can! Absolutley! Joann’s clearance is so great! I got two Cristmas card kits 5 bucks a piece. It’s a gold mine. Hope you got the machine fixed up–I hate it when mine does that. Like the others, I find it’s usually a tension problem solved with either a new bobbin or a rethread of the needle, from the spool. I don’t have plain yogurt at home, but I have some lemon yogurt–maybe I’ll try the cake recipe you’ve pointed at and just cut back on the juice a bit…I love citrus-flavored cakes. Yum. How’s the pouch? My sewing machine does that sometimes too. I don’t know why. Where in WI did you used to live? New to your blog, and I am sure it’s here in the archives. 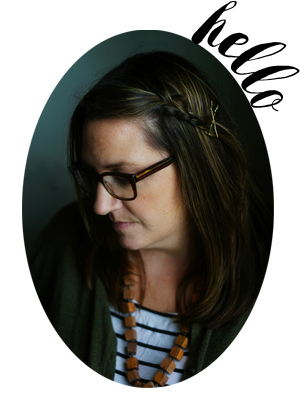 Hello from a Wisconsin Mama who now has you bookmarked as a Favorite! Sometimes putting the thread through the eye of the needle the wrong direction can do this (who knew that could matter?) Also, putting the bobbin in its case backward can do it. Good luck. Try vacuuming it out, I know sound odd but works wonders more times than I’d like to think about. BTW I’ve been loving watching your girls grow up. How are you feeling with 3.
i have been thinking about a bird too. are they really that hard to keep up? how did you not come home with one?? you are a strong lady. You might have to pony up and take the machine in to be worked on. Mine was doing that forever and I finally just took the darn thing in and it’s worked fine for over two years. See, my friend’s little kids were over and I saw them playing with it. I think they messed up the tension to a point that I just couldn’t repair it myself. just in case you haven’t figured out the sewing problem, I had a similar problem. I tried everything I could think of. All it ended up being was the screw was loose on the bobbin case. I tightened it up with my sewing screw and voila…good as new. Hope that helps. i usually give mine a good clean and try to start of sewing properly and not go straight to warp speed !!!! I want to get my middle daughter a gecko for her birthday this year but I need to talk hubby into this, I have until November so I have some time yet. My sewing machine just did this yesterday and I found near my bottom bobbin thread caught that was pulling the bottom threads like that. I’m absolutely loving the bedspreads you found. I’m going to be making some our your grandma’s granola for this years Christmas gifts. my machine does that when I need to change the needle1 I call her a princess for that very reason!